An atmosphere of gloom prevailed in the galleries of the United Nations Conference Centre in Bangkok on October 9, 2008. It was the last day of talks on climate change, and there was near-unanimity that the Kyoto Protocol was going to die. Delegates from developing countries were an angry lot. Those from developed countries did not seem to care much. The penultimate meeting, just a few negotiating days before the big one at Danish capital Copenhagen in December, had been chosen to sound the death knell for the internationally binding agreement on emission reductions (see box Genesis of Kyoto). Chinese chief negotiator Yu Qingtai put it succinctly Developed country partners are trying to invent something totally new two months before Copenhagen and asking everybody else to come along. Thats not the way to conduct negotiations. The first nail in the coffin was driven in by the US, the biggest polluter that first refused to ratify the Kyoto Protocol and is now dragging its feet on committing to a healthy cut in emissions. US inaction, cried delegations of developing countries, is inciting other developed countries to dump the protocol. The developed countries need to rise to the challenge rather than race to the bottom with the US, said Lumumba Stanislaus-Kaw Di Aping, head of Sudanese delegation and chair of G77 plus China. But isnt the Barack Obama administration more progressive about climate change? Obama has only offered some of the most progressive utterances, Lumumba shot back. In the last week of talks in Bangkok developed countries (referred to as Annex I under the protocol) developed cold feet; they were not ready to commit to emission reduction targets for the second phase of the Kyoto Protocol. The first phase ends in 2012. The discussion came to a standstill. In addition to the US, the European Union (EU), which had for long been claiming the moral high ground, turned out to be the villain. EU had proposed a reduction target of 20 per cent below 1990 levels by 2020. This could go up to 30 per cent if an ambitious deal were signed in Copenhagen. EU had been banking on the US passing its climate change bill before the Copenhagen meet (see Kerry-Boxer doesnt pack a punch on P 28). That would have meant some sort of legal commitment from the US to reduce its emissions. But during the Bangkok meet it became clear that the US climate legislation would not be ready in time for Copenhagen. So EU was faced with a situation where it would have committed to a reduction target without any commitment from the US. Seeing that the biggest polluter might not come to Copenhagen with any reduction target, most developed countries began abandoning the Kyoto process. Japan, the other major party under Kyoto, has also expressed reservations about continuing under a Kyoto regime. The negotiations on climate change take place under two ad hoc working groups. The deadlock in the group discussing the reduction targets for Annex I countries had repercussions on the group debating long-term emission cuts by all nations and implementation of the Bali Action Plan, a roadmap to conclude a deal at Copenhagen. After failed negotiations in the first group, developing countries did not see any merit in continuing with negotiations in the second group. The ground was prepared for EU to make a pitch for a new unified treaty. There is now a concerted effort to somehow put the Kyoto Protocol aside and to say we need a new instrument in which the commitments of both those that are party to the protocol and those that are not party to the protocol could be reflected, said Shyam Saran, Indian prime ministers special envoy on climate change. But the new treaty is also meant to reflect the commitments of developing countries, or at least the major developing countries. It is a call to throw out of the window the differentiation of responsibility for climate change. Emissions by the developed countries over the past decades are today haunting the developing countries. Developed nations are responsible, developing countries are not. This differentiation is at the heart of the UN Framework Convention on Climate Change (unfccc) and climate negotiations. Under Kyoto, developing countries are allowed to increase emissions so that they can develop. EU reaffirmed its faith in the Kyoto process at press conferences, but said it was looking at one legal treaty that would include the Kyoto system, albeit in bits and pieces. Developing countries are sceptical. 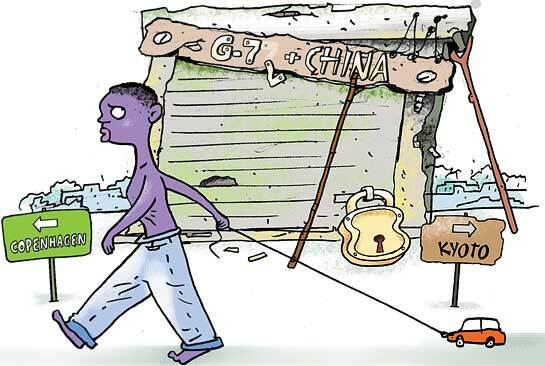 We do not accept the argument that you can save a legal instrument by tearing it to pieces and keeping the parts that you believe are good, Chinese negotiator Yu retorted. Its a basic contradiction; you kill a document so that you can save it. We are being told that a new and single instrument is essential if we want an agreement at Copenhagen. It does not need a great deal of imagination to see what this could lead to, Saran said in the closing plenary in Bangkok. The proposals, far from enhancing climate change actions, will end up diluting the commitments of Annex I countries, unilaterally imposing new commitments and burdens on developing countries, he added. Developing countries, more specifically what are termed emerging economies, the likes of India and China, are under pressure from developed countries to commit to emission-reduction targets. The US and EU have been bullying them to abandon the equity principlethat every individual has an equal share of atmospheric spaceand to focus on actual emissions. We want to achieve the substantive goals of Kyoto, but we can do this only if we widen the participation. We are convinced that we need to bring into a single legal instrument all that we have done in Kyoto but make it applicable to a much wider participationthe US on the one hand and the emerging developing countries who have become large emitters on the other hand, Jonathan Pershing, the chief US negotiator, said in Bangkok. 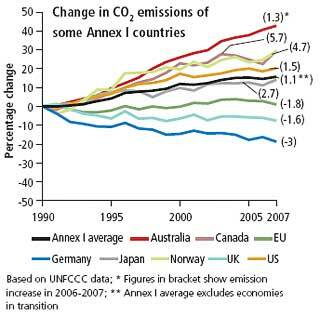 Adopting the same tenor, EU advocated dumping the per capita emissions approach based on the equity principle. Speaking on behalf of the developing nations, Yu tore into their web of arguments. Emission aggregates dont stand alone in abstract. Behind a countrys emissions are human beings. Each of them is entitled to a fair share of the common atmospheric space in the world, he said. I am sure everyone believes all are born equal. As a Chinese, I dont think anyone can persuade me to believe that being born a Chinese would give me less entitlement compared to what someone born in a developed country would get. That is politically and morally incorrect. In the midst of relentless pressure and lobbying it seems one person blinked.